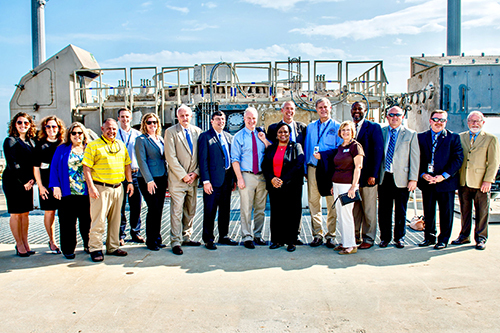 WALLOPS ISLAND, Va. ­– Maryland District 38 State Senator Jim Mathias and U.S. 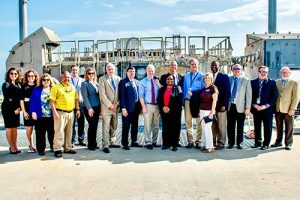 Senator Chris Van Hollen toured the NASA Wallops Island Flight Facility this week to get a firsthand look at the employment and national value that Wallops Island provides Maryland and its citizens. Mathias initiated the senator’s visit to spotlight the vast opportunities Wallops has provided for the state. Wallops Island is a regional driver for the future of technical and engineering programs on a national level. The facility is home to operations for not just NASA, where it serves as a space station supply hub, but for the U.S. Navy, the National Oceanic and Atmospheric Administration, and private-sector industries like Orbital ATK. Together, they create hundreds of jobs for residents of the Lower Eastern Shore of Maryland. “As the unmanned aviation, private sector rocket launch research, meteorological studies, and technological advancement and development continue, there are more opportunities for tech jobs coming to the Lower Shore,” Mathias said. Recent investments such as the University of Maryland Eastern Shore’s new Aviation Engineering building and the Worcester Technical High School’s new pre-engineering program put the students of Worcester, Wicomico, and Somerset counties in a great position to benefit from the growth of the aerospace industry in Maryland and the Eastern Shore, according to Mathias.